Founder of Program Systems Institute of Russian Academy of Sciences. 1959: M.A. in electrical engineering, Zhukovsky Aircraft Academy. 1963: Cand. Sc. (Ph.D.) in engineering, Bauman Higher Technical College. 1972: Doctor of Science in engineering, Institute of Control Problems. 1993: Member of the International Informatization Academy. 1994: Member of the Russian Academy of Natural Sciences. 1964-1975: Work in aviation industry. 1975-1983: Deputy director of VNTICenter, Moscow. 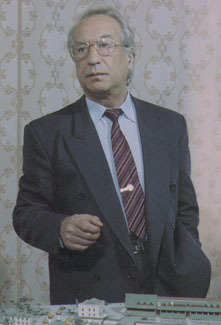 1983-1984: Research industrial corporation "Poisk", department head. 1984-1986: Director of Pereslavl branch of the Institute of Cybernetics Problems. 1986-2003: Director of Program Systems Institute. 1993-2003: Rector of the University of Pereslavl. Prof. Ailamazyan is the author of 100 research papers, 2 monographs and 20 inventions. Honorary citizen of the town of Pereslavl-Zalessky.